From the largest Civil War Battlefield in NC at Bentonville to the county’s Hollywood connection at the Ava Gardner Museum in Smithfield, we invite you to explore all corners of the county. 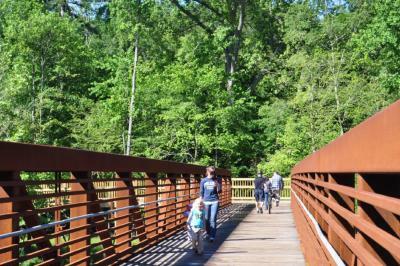 Get out and experience nature at several greenways (or fairways for golfers), parks and forests for hiking and biking, or pamper yourself for the day at an area spa. We want to share our agritourism culture with you at area museums like the Tobacco Farm Life Museum in Kenly and on-farm tours, pick-your-own, and special events at Smith’s Family Strawberry Farm and Boyette Family Farms. Get to know our area farm families and how it connects to area restaurants and culinary trails – you can visit a farm and take back locally sourced products…Yum! Johnston County, or JoCo as locals fondly refer to our community, is convenient for day trips from Raleigh, Fayetteville or Wilmington to enjoy a culinary trail for barbecue and stops at area wineries, breweries and a distillery. Taste, sip, and enjoy a night out for a performance, music or comedy at area venues like the Rudy Theatre or check our calendar of events for upcoming festivals! Please remember to use the hashtag #VisitJoCo to help share social posts and promote all things JoCo!